When devising any interior design scheme it's a huge plus for the designer to have a strong focal point to work with. Bathrooms can prove to be a particular challenge with potential limitations on space and balancing these with the need to create functionality and, of course, style. However, the pay-off from creating a dream bathroom is worth every second of the planning process! For many of us, a crucial part of modern bathroom living has to be the shower; it's fast, convenient and best suited to our busy schedules due to its 'wash-and-go' function. Therefore, choosing the right shower enclosure is crucial to the overall success of your bathroom. So today's focal point is brought to us via these stunning Shower units from Mira showers. My favourite enclosure (by a tiny margin) is the Beam divider panel (no.2 'above'), due to its clean simple lines and minimalist-look, but having said this, I also love the rather curvaceous lines of Mira's Beam alcove enclosure (no.2 'below'). Of course, with any strong design statement like these shower units, you need the accessories to create the perfect design statement in your bathroom, right? 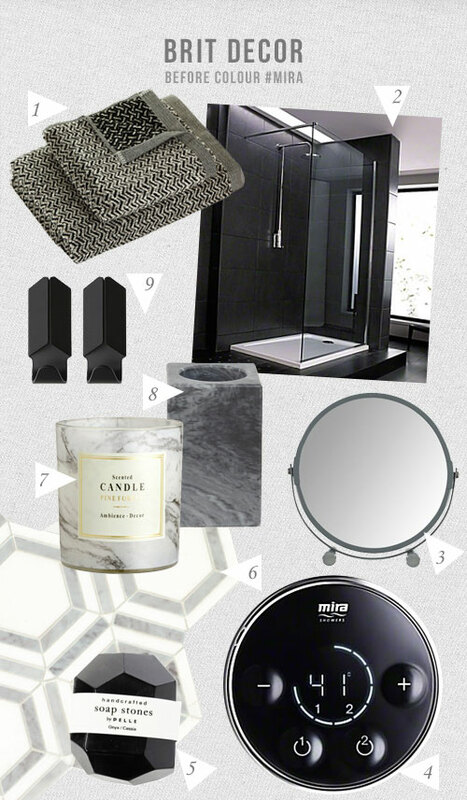 Based around each Mira shower enclosure I have created two trending themes to compliment these; Before Colour explores my continuing love affair with monochrome, which I have softened with stylish greys in a selection of clean and minimal lines. Then there's my Copper Cool palette, which in contrast to the monochrome styling exudes warmth and energy with earthy reds and shiny copper metallics - the perfect Autumnal palette! I love the herringbone-meets-chevron design of these tempting towels from Amara (no.1 above) and for that added slick and techno-cool design feature, I couldn't resist including the slick Beam divider panel, also from Mira (no.4 'above'). The elegant hexagonal detailing on Fired Earth's beautiful High Society Rockefeller tiles (no. 6 'above') deliver a high-end finish to this scheme (I gotta get me some of these!). And on the subject of sharp lines, I love the black Cassia soap bar from The Conran Shop for those quirky design details that are oh-so important to the overall finish of any room. What is it about Copper that is driving the design world crazy right now? I only have to take a glance at this warm and glossy material to know why - it's simply stunning. If you are looking for a warm and inviting palette, this could be the one with these med-style Alicante terracotta tiles from Mandarin Stone (no.5 'below') which will also offer the perfect contrast to a pure white bathroom suite. I have to admit that I am pretty captivated by this copper toned glass mirror from Heals (no.8 'below) - for that unique design feature. 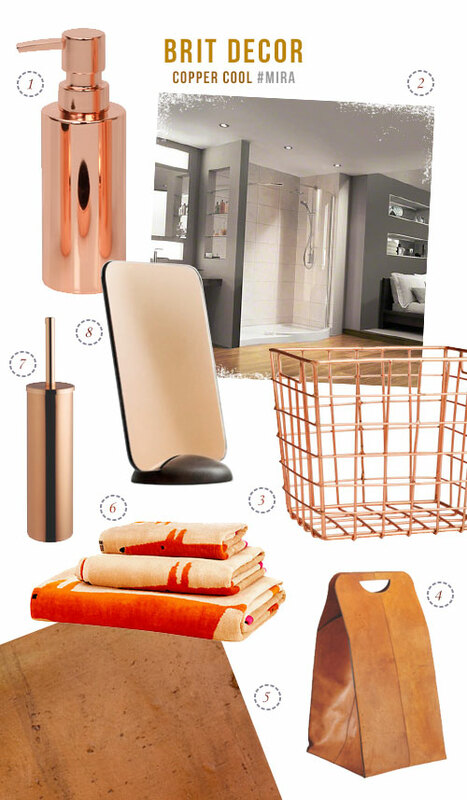 For value interiors fashion accessories, there's the striking copper-effect metal storage basket from H&M (no.3 'below') because storage is another crucial factor to creating a successful bathroom. And for that luxe-feel, I am smitten with Habitat's clasp leather laundry bag (no.4 'below'). So which palette are you? Copper Cool or Before Colour?